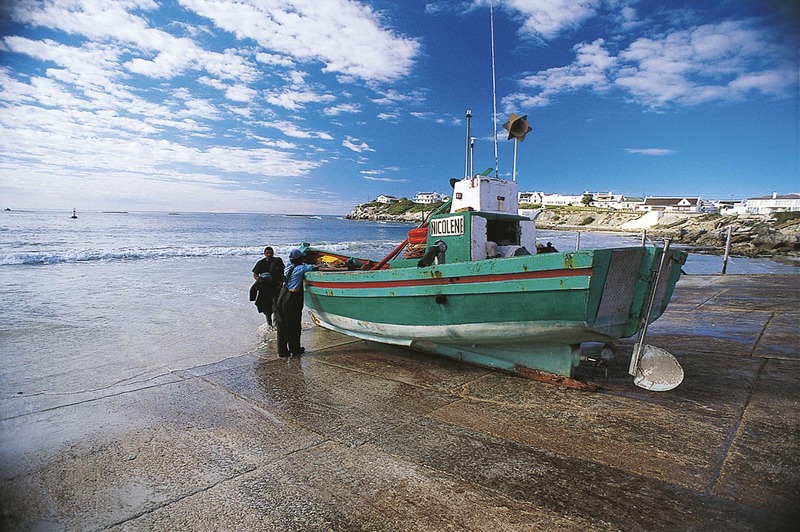 Arniston is situated at the foot of Africa, as if dipping a sandy toe into the sea. It is sandwiched between two nature reserves, De Mond and De Hoop. As you drive from the town of Caledon, famed for its hot springs, you’ll see the landscape of the Overberg falling away before you. In spring and early summer the hills and contoured fields are bright yellow with canola. This rich farmland with rolling hills punctuated with clumps of eucalyptus is also known for sheep farming. And if you’re travelling in winter, the road verge will be lit up with scarlet candelabras of aloe. Our jagged coastline with its countless wrecks is a chilling tribute to the seafarers of yesteryear. Arniston derives its name from one of these wrecks, namely the British ‘Arniston Transport’ which sank here in 1815. The vessel was loaded with wounded soldiers to take them from Ceylon back to England. Heavy winds had destroyed all the sails and it was eventually decided to cut away the three anchors and run the ship ashore. The Arniston broke up on the needle-sharp rocks of the Arniston Reef. Of the 378 passengers only 6 survived, rendering this disaster one of the most serious in the history of South Africa. In February of 1816, the Geils family travelled from Ceylon to the Cape Colony to erect a small monument in memory of their four eldest sons and Lord and Lady Molesworth. In September 1816 a monument was erected overlooking the wreck site. However, over time the monument, a stone tablet with an inscription fixed to a brickwork pedestal, weathered and crumbled. In 1905 the sand-damaged tablet was removed and its current resting place is in the Bredasdorp Shipwreck Museum. In March 2010, a new monument was constructed by Robert Haarburger. It was built in the same style and form as the original monument. The new monument stands in an elevated position, with the backdrop of desolate sand dunes, facing the wreck site and the ocean where the Arniston Transport came to its tragic end. For generations the fishermen of Kassiesbaai launched their small boats from the beach at Oubaai (now known as Roman Beach) and rowed out into the bay to fish for their catch. They used to fish within sight of the shoreline and would race one another back to sell their catch. It’s only in the last 100 years that they began using the area below Kassiesbaai to launch their boats. In order to get heavier boats in and out of the water, they used wooden rollers. It was a slow and cumbersome process – often in bad weather they could not get out into the bay. In 1936 a slipway was built and launching a boat became much easier. These days, a tractor is used to help the boats down the concrete slipway and into the waiting ocean. When the weather allows, the fishing fleet of old-school ‘chuckies’, carrying seven or eight men each, goes out to sea in hope of a good catch. Arniston is the only town in South Africa with two official names. 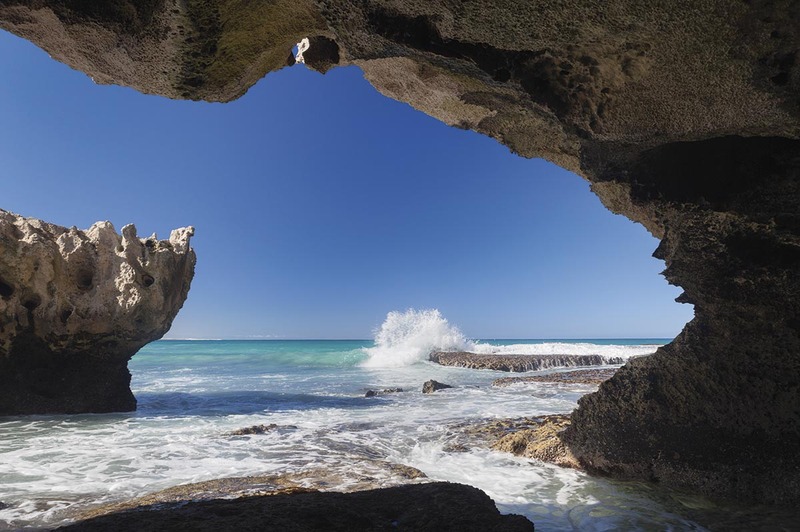 Its Afrikaans name, Waenhuiskrans, is derived from the town’s most incredible natural feature, an enormous sea cave which is only accessible at low tide. A literal translation of the name means ‘wagon house cliff’ – a reference to the belief that it would be possible for a wagon and a full span of oxen to turn around inside the massive cave. If you visit Arniston, a walk to the cave at low tide is a must. This is one of the last working fishing villages on the coast of South Africa. Kassiesbaai began in a makeshift way. The name is derived from the wooden crates or paraffin kassies (boxes) that washed up on shore from shipwrecks. These were often used by early fishermen as building material for their homes. Boxes were stacked on top of one another, the sides worked off with clay plaster and the structure covered with a thatched roof. 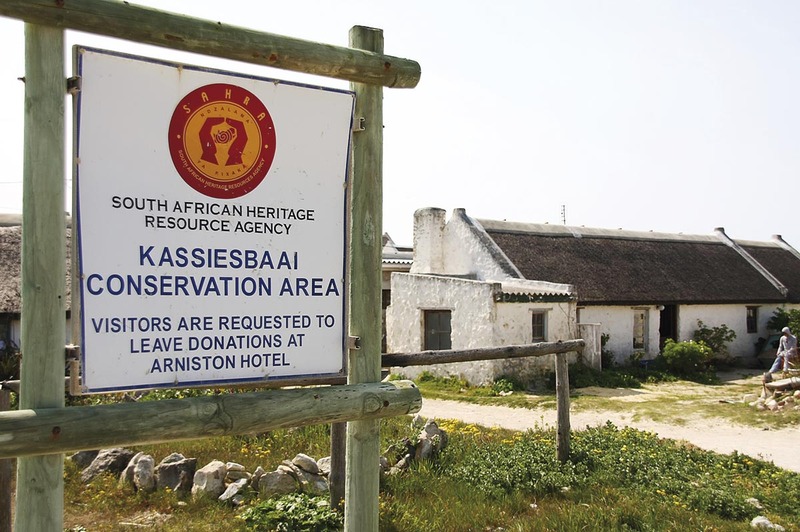 In 1984 the fishing village of Kassiesbaai was declared a Grade One Heritage Site, to be protected for future generations. A wander along the coast of Arniston at low tide will reveal many ingenious fish traps, which are still in use today. 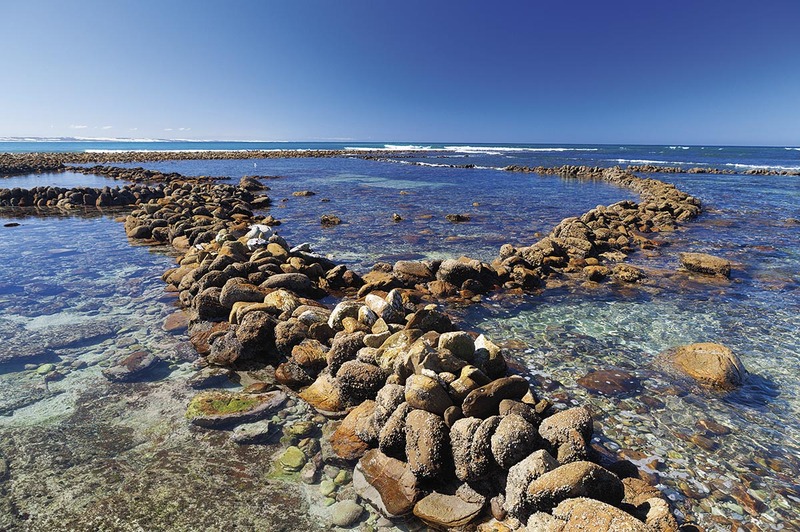 The ancient fish traps are best viewed at low tide when the distinctive rock pools are clearly visible in the water. Recent research reveals that the first homo sapiens lived on the southern tip of Africa some 165 000 years ago. All around you are reminders of the shore-dwellers who lived here in the late Stone Age, their charred or glittering middens of shell remnants, their fish traps and the caves in which they sheltered from winter storms. They built great fires on the beaches, cooked fish on hot stones, made flints to open shells and left behind the sandy mounds of debris known as shell middens, containing seashells, clay pottery, and the bones of fish, seals and small buck. The shell middens of Arniston tell rich stories of the past and are a visible record of days gone by. About a 45 minute walk from Arnsiton Seaside Cottages, is the Struispunt Beacon, or ‘Baken’ as it is known locally. This nondescript concrete obelisk, plonked on a patch of straggly coastline is there for a reason – to warn sailors of the undersea perils of Die Rift (Saxon Reef) – an archipelago of submerged rocks that extends three miles out to sea and has claimed at least 14 ships. In about 1900, the Baken as we know it today, was built. It is made from local stone, painstakingly sourced and cut to size, and was then painted with red stripes.